Scattered around Ryerson University campus are black, white, and red posters. Most are torn, some are on the ground, and only a few are legible. The posters are advocating for Bill 148, which passed Nov 22. The bill will provide $15 minimum wage for all Ontario workers by Jan. 1, 2019. Angel Tsiu, who works at Toronto’s Rec Room, is apprehensive about the changes coming to Ontario in the new year. Tsiu doesn’t think she has a choice but to abide by the new Ontario rules. She said that inflation will be the biggest problem for her, and she may no longer be able to live in Toronto. She lives in a shared bachelor apartment with her boyfriend and the pair have received notice that rent will be increasing by over $200 in January. “Everything’s going to drastically go up,” Tsiu said about the inflation she expects to happen in Toronto. Ontario is currently below the ideal inflation rate targeted by the Bank of Canada. The aim is to keep the inflation at a two per cent midpoint, at a target between one to three per cent. Currently, the inflation rate has risen to 1.6 per cent from last year’s 1.4 per cent. This means the inflation rate is even less than what the Bank of Canada wants, and Ontario is doing well. The insecurity Tsiu feels about the increased wage is still normal, despite Ontario’s inflation rate target. 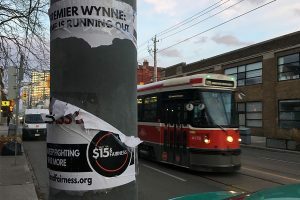 John Isbister, an economics professor at Ryerson, said Ontario has never seen such a big increase in minimum wage and no one can know what’s going to happen in January, when the minimum wage will increase from $11.60 to $14.00 per hour. Change can be scary for most people, but Isbister is optimistic about the increased wage. Ontario is making minimum wage more of a living wage. The minimum wage should reflect how expensive it is to live in a city based off of a 35-hour work week. The expense considers rental housing, food, clothing, and transportation, among other things. According to the Canadian Centre for Policy Alternatives, this would be $16.60 per hour in Toronto. Isbister said previous studies show that the increase won’t have a serious impact on Ontario’s economy; however, more recent studies show how it could. “It’s probably going to have some impact on employment, but not very much,” said Isbister. He considers the wage increase to be good overall. Simply put, he said it helps minimum wage workers afford to live. Isbister’s only concern is with local, family-run stores, who may not be able to afford to pay their staff. According to Ian Boyd, it’s a valid concern. Boyd, the owner of Compact Music Inc. said that the only way to compensate for the increased expense is through layoff. Boyd said that small businesses are automatically at a disadvantage because of the wage increase. Compact Music Inc. is a small, family-owned record shop with locations in Ontario. The stores are overflowing with old vinyl records, and boast an old-school vibe. It’s obvious the stores don’t like change. “When the minimum wage goes to $15 an hour, we are considering dropping hours and part time staff completely,” said Boyd. Although Boyd and his brother, James, own the stores, they rely on a few part-time workers to run them as well. Boyd’s store manager in Ottawa, Tyler Clarke, currently makes $15.75 per hour. It has taken him 10 years to earn his wage, and Boyd said he doesn’t want Clarke, or any other staff, to feel that the responsibilities that come with the job are equal to a minimum wage job. Clarke’s wage most likely won’t be able to increase very much in January, but Boyd said he will have to make a few adjustments. Other stores across Ontario may find themselves making the same adjustments. The incremental wage increase is most likely a way the Liberal government is trying to make the transition a little easier for everyone, not just local business, said Isbister. It’s going to be a change for Ontario, and there’s no sure way of knowing what exactly is going to happen when minimum wage is increased. Tsiu, like Boyd, says the overall outcome won’t be healthy for the Ontario community. But the concept is there; minimum wage should reflect how much it costs to live, and nothing less. Isbister says the current minimum wage isn’t sustainable. When minimum wage grows, so does the quality of living. If the minimum wage isn’t enough to be able to live on, then some things should change.